For the transport of rotor blades and small tower segments, HYZER offers flatbed semitrailers and gooseneck semitrailers. 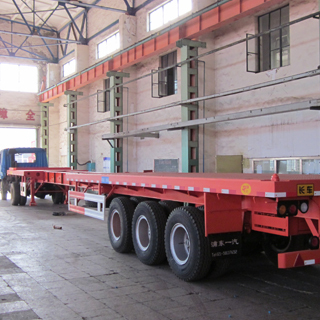 The loading platform length of the semitrailer is 30m to 40m.The payloads of these vehicles range between 20ton and 60ton. Turn Lock: 12, Which may load one set of container with 40’ and 2 sets of containers with 20’ or one set of container with 20’ on middle of the platform.